If you would like to join the biggest annual FRP gathering of the year, please read on this is my first time organising this event so I may be somewhat flaky around the edges. This event is hosted by RS Owners Club Bristol. The club stand is RPOC. 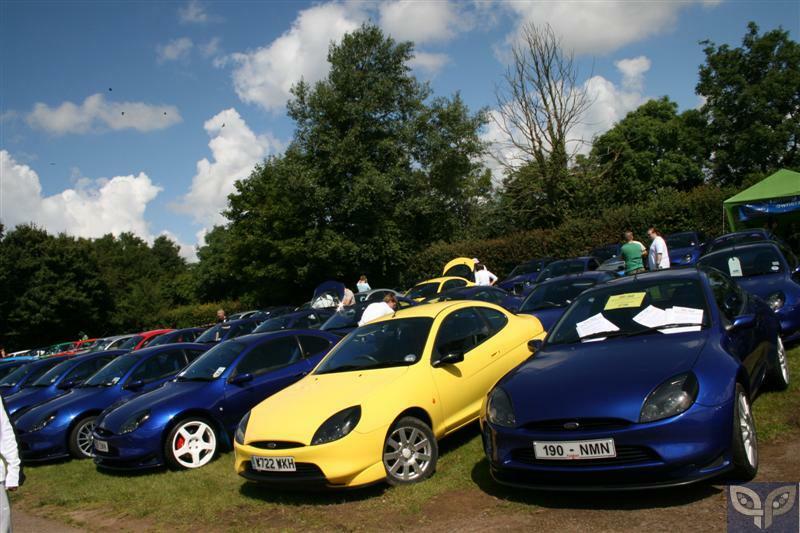 The event takes place on Saturday July 5th, and as with previous years FRP and Puma owners invited to participate in a giant paddock display, and (for FRPs) the famous lunchtime parade around Castle Combe circuit (typically 3 laps). All Pumas park in the same display area. The parade cost is one admission fee and a £5 donation to the event's charity. So for one FRP and one driver it will be a combined cost of £17* if you want to parade at lunch time. Advance* entry ticket to the show (each occupant of your car will require a ticket, including drivers) - £12. (*Tickets on the day will be £15 each). Due to the popularity of this event, I will be purchasing our tickets in advance; this allows our group of arriving Puma’s to smoothly enter the site in one group without having to stop to buy tickets on the gate. Please ensure to send payment as a GIFT so no charges occur. With your payment please include your name, full postage address, Puma type, car registration number and forum name. If you wish to send me the payment by other means such as Cheque (at your own postal risk) then you need to send me a PM for details. The pre-purchased tickets and paddock passes will be handed out on the morning of the event at our pre-meet assembly point of Morrisons supermarket, Chippenham. This is a great place to grab breakfast and last-minute supplies, plus there is a BP petrol station on the entrance road to the store. Please be courteous to other users of the store car park. Those attending should aim to arrive at Morrisons between 0815 - 0845hrs - the whole group will be leaving Morrisons at 0900hrs promptly. Note: Racing Puma owners who are taking part on the lunch time parade - as with previous years there will be insurance indemnity paperwork form for you to sign on the day that will permit you to take part. Do please bring your driving licence as from memory you need the number for the indemnity form. Closing date of entries is going to have to be Sunday the 1st of June to allow me enough time to get our fees in without flapping. I have posted this in 5 places and will do my best to keep each post with one combined list of attendees. Hopefully the day won't be a busy as Japfest last Saturday. It took a couple of mates 2.5 hours to get from the Bumpers Farm roundabout in Chippenham to the circuit. They set out at 8:00. There was NO spectator parking at the circuit as it was all car clubs. Spectators had to park in the fields on the other side of the road. So far we have 5 on the stand and I can think of hopefully one more who might be along too, the more the merrier. MikeB should be in contact with you Kate. Never one to miss the Castle Coombe meet, can you put me down for an entry ticket and a couple of laps. Payment completed on PayPal. I will be sending off payment for those that have paid on Wednesday 4th June and not later. If you have not paid before I send off the paperwork then it is not a certainty that you would be able to display your car on the stand. The parade entries have to be submitted and paid for BEFORE the event. Tickets for extra passengers can be purchased at the gate on the day and there may be a spare stand pass availble but I can not guarantee this. For those coming I need to also have a contact number please and a mobile as preference or alternatively home number, I have just established I need this when I fill in the forms for sending this WEDNESDAY the 4th June..
All of those attending (except Chris) I must have a phone number to please. Note: Racing Puma owners who are taking part on the lunch time parade - as with previous years there will be insurance indemnity paperwork form for you to sign that will permit you to take part. Do please bring your driving licence on the day. The form can be found here of you want to come prepared. If you have any questions please ask away and I will try my best to answer them. I'm looking forward to this also. Kate, I just PMd you my number etc. The indenity forms needs driving license. Those are handed in in one bunch on the day. I gave a link above to fill it in and bring it with you with driving license. Is it too late to book me & the thunder in for this? [size=4][font=Impact]this must be the place! That is it all payments now in, forms done sealed and will be posted first thing. I am accepting no more pre payments. I will have only a few spare stand passes so tickets can always be bought on the day or directly from the rscombe.com website. But please check first that there is a spare stand place before turning up. Will update attendence list tomorrow. I am applying for extra stand passes, so if I get them then of course be brill to come along too, just buy your admission tickets at the gate or online before hand. So let's say yes and once the stand passes arrive I will ear mark one for you, be good to have you there. We have 18 FRPs and one Thunder on the stand />/>/>/>/>/>. Names below. Whilst I am not going to process any more advance tickets myself, I have asked for a few extra spare stand passes, so if there is anyone else who would like to join us at this fabulous event please let me know. Advance tickets can be bought online directly or tickets can be bought on the day at the gate (the price is £15 each adult on the day). But please check with me first to see if I have a stand pass you could have. Right now I have spare passes it would be really great to share the day with any others who would like to come rock too. Nearer the time I will post about where we are meeting and what you need to bring for the day.